This article is scripted and translated from Russian issue No.124 of the online podcast of Pu-erh FM Radio created and hosted by my fellow tea specialist from Russia Anton Dmitraschuk. The name of the issue is “Dry and Wet. Shengs of Different Storage”. First of all, this material will be helpful to those just getting to know tastes of differently stored pu-erhs though experienced tea lovers may also find something interesting for themselves. In view of the long duration of the issue, it is provided here in a somewhat abridged form. About how storage conditions influence the development of sheng pu-erh taste. About traditional Hong Kong storage. About natural storage in different climates. And about what formation of taste preferences depends on. When talking to tea lovers from different cities, I noticed a strange tendency of recent time: calling everything wet storage. Without exaggeration, almost every day you hear almost any matured sheng with a bright, dense and juicy taste called “wet stored sheng” and any shu vaguely resembling aged sheng referred to as “wet stored shu”. I am used to a different treatment of the words. For me “wet storage” has always been a particular and relatively rare technology implying intensive artificial moistening of the room where tea is stored and sometimes even of the tea itself. The Chinese often view things even more drastically. 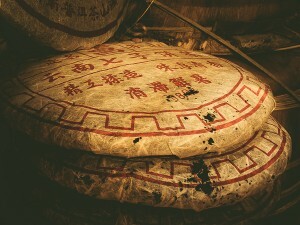 For example, Deng Shihai (who is quite a reputable person, he was among pioneers in reviving interest to pu-erh that developed into a real pu-erh boom and to a large extent set the tone and direction of the revival) drew a clear dividing line: wet storage sheng is one that has microfungi aspergillus while dry storage sheng is that without aspergillus, and that’s it. Of course, this opinion should not be taken as the ultimate truth and a revelation, it is just one of the possible approaches which in addition reflects a principle that is rather typical of the Chinese: judging by the final outcome. However, not every sheng stored under artificial moistening contains a noticeable amount of fungi. But this approach is logical because shengs without the fungi and those with them are two different products that should not be assessed with the same measure. Just like ordinary cheeses and those with noble blue or white mold. 2006 Hong Tai Chang raw pu-erh tea of clean and dry Thai storage. No camphor notes in the taste. So, let’s consider the matter substantially starting from scratch. Sheng pu-erh is potentially able to be stored for a long time, at least for decades, and time makes it change and mature. The rate and character of the changes sheng undergoes in the course of time, depend on storage conditions and, first of all, on humidity. The higher the humidity, the faster sheng changes. Besides, the character of the changes, the taste and flavor formed as a result vary depending on whether the humidity is medium or high. This is accounted for by microorganism activities: sheng pu-erhs have richer natural microbial flora and under different conditions, different kinds of bacteria and fungi propagate and exhibit their activity to a greater or lesser degree, and this has an impact on the taste and flavor of the tea. 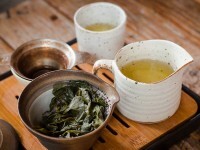 It should be understood that although increased humidity and temperature speed up maturing of sheng, excessive humidity (90% or more) and too high temperature (45°C and higher) may harm the tea. 1988 Hong Tai Chang raw pu-erh tea stored in Thailand. Dry tropical storage, which can also boast Malaysia and Taiwan. Two essential notes: first, relative and absolute humidity should be distinguished. Absolute humidity is moisture content in the air in grams per cubic meter while relative humidity, put simply, is the percentage of moisture relative to the amount that can be contained in air at the given temperature, that is to what extent air is saturated with moisture. When talking about storage of shengs, relative humidity is usually mentioned. But it should be remembered that relative humidity of 70% at 30°C means that a cubic meter of air contains 21 gr. of water and at 10°C – only 7 gr. I don’t know what is more important for sheng, relative humidity percentage or the real moisture content in the air but in any case, the temperature also matters – the higher it is, the faster the changes take place. And even if it was possible to reproduce Guangzhou humidity in Moscow storage the result would be different. 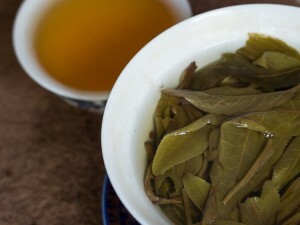 Secondly, concerning the temperature sheng should be kept at, we should distinguish between a permissible or acceptable storage humidity which does not cause its drying or deterioration (and experience shows that it is 50-60% or even 40% at 20-25°C) and a desirable humidity at which Sheng really develops and its taste improves. This depends on the taste we want to obtain. Most Chinese would probably consider 70-80% to be the optimal level but opinions may vary. 2006 Sheng Pu-erh from Ming Dee factory. The average storage humidity during the year is 70-80%. In the taste a rich fruit mix, herbs, and wood. However, it is obvious that relatively low humidity is sufficient to avoid spoiling sheng and prevent its taste from deteriorating while a considerably higher humidity is required to make it notably better. 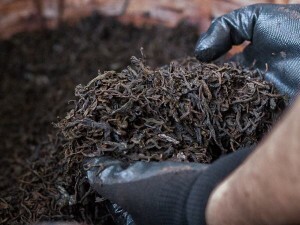 That is the reason why it is sometimes said that in Russia shengs can only be stored for gradual consumption or selling in the best case, while if you are seriously interested in collecting sheng pu-erh, investing in it, monitoring changes in its taste, your collection has to be stored in a country with a more humid and warmer climate. So, shengs can be stored either under natural conditions (but, of course, protected from any adverse factors), as it is most often the case, or in storage facilities where additional artificial moistening is provided – water is sprayed, water mist or vapor is dispersed so that relative humidity can reach 95% or even more. This is what is called wet storage. This storage method is traditional for Hong Kong but, of course, it does not mean that all Hong Kong tea is that of wet storage. This type of storage makes tea change faster but there is a higher risk of uncontrolled development of microbial flora including that not beneficial for tea – put bluntly, mold – and to prevent this, special measures have to be taken: continuous control of the tea condition, its frequent flipping to prevent its soaking, etc. ; and even in this case some tea is inevitably lost. It is also important to monitor the temperature (it should be high but within certain limits) and aeration (air flow), which makes it quite a sophisticated process. 1993 Thai loose raw pu-erh tea. The dry storage. It can even hardly be called storage, in fact, it is not spontaneous maturing but a purposeful and controlled transformation of tea that is in many aspects similar to the shu production technology. In a similar manner, high humidity and temperature are maintained to create conditions for the development of microorganisms that change the taste of tea, but here the process takes years, up to 10 years or even more, instead of weeks. In the most traditional variant, after a few years of this aging, tea is transferred to a space with medium humidity and some time later to a space with low humidity where it is then stored at rest. This results in obtaining tea which is not only fast maturing but having a rather peculiar flavor and taste which is smooth and full but evoking distinct associations with silage or a compost heap in some people. This sensation is difficult to describe but it’s even more difficult to confuse it with anything else or forget it if you have tried it at least once. This kind of sheng can be loved or not loved, understood or not understood but it should be remembered that wet storage shengs are not all masterpieces and are not all trash – they may be different. Similarly, natural storage, that is storage under natural conditions, can be either improper causing drying and spoiling of sheng or proper and unlocking potential of its taste (but in a way that differs from wet storage). Of course, it is much more various because climates of different regions vary greatly and the mean level of temperature and humidity is not the only factor that matters, their fluctuations throughout the year are also important. In Kunming, the administrative center of Yunnan, the climate is mainly drier, while in Hong Kong, on Taiwan and in Malaysia and especially in Guangzhou, it is more humid but all of it is the same line, the same story while Hong Kong wet storage is quite a different thing! But high natural humidity in Guangzhou sometimes makes shengs of natural Guangzhou type storage similar to those of Hong Kong wet storage. This should be taken into account but these two storage methods should not be equated. In general, it is essential to understand that the region of storage is what really matters and is often specified for collectible shengs. Combined storage is also not so rare and it makes the picture even more variegated: a sheng can be kept in one place for some time and then in another. According to my modest experience, an interesting result can be obtained by storing tea in a humid climate for several years and then in a drier one. It should also be remembered that, apart from storage conditions, changing of sheng pu-erh taste with time depends on many other factors: on the region of origin of the product, the season of its harvesting, on how it has been pressed, etc. All these factors totaled up, create a complicated picture so I am not sure if it is always reasonable to distinguish clearly between them. For example, I cannot always tell the difference between natural Taiwan or natural Hong Kong storage and traditional Hong Kong storage, though it must be easier when you have more experience. But for me, matured shengs are more like a continuous spectrum than a finite number of separate categories, and I currently believe that it is more reasonable to treat any such tea as a particular phenomenon than immediately pin labels such as “dry” and “wet” and rely on them. As for shu pu-erh, it is seldom kept in wet storage, if ever. Shu hardly changes with time – it is not without a reason that it is “ready-made”, and its storage is not aimed at improving its taste, so wet storage can hardly do any good while there is a risk of spoiling. And, in any case, it is associated with large additional expenses. The question about which method and storage conditions are better is inadequate. It can also be said that Taiwan and Hong Kong storage tea prevails in any decent collections of mature shengs, while tea of Kunming – expressly dry – storage can hardly be ever found among collectible shengs. 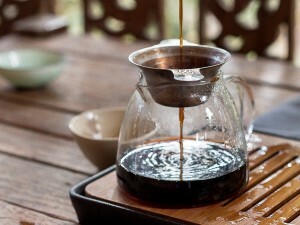 However, this may be associated with historical and economic reasons, for example, the fact that in Hong Kong and on Taiwan, the interest to mature pu-erh arose much earlier than in Yunnan where the idea of collecting pu-erh started gaining popularity only at the very end of the 20th century. Adherents of drier storage often state that wet storage shengs and even simply Guangzhou shengs are too uniform, too similar to each other while shengs stored under dry conditions have more particular, recognizable properties so that one can discern the factory’s specific character, etc. And I agree that it may seem true at first sight – a few years ago I would have said that myself. But with development and training of taste, this impression changes to the opposite one: in shengs stored in wet climates, you start distinguishing numerous nuances which can be gone over and enjoyed while most dry storage shengs lack those nuances, there are only some clear aspects to savor which soon become exhausted soon the taste gets boring. 1980 Raw pu-erh tea from old tea trees. Wet storage. In the taste are camphor, nuts, old-woody notes. The cheese analogy works perfectly here: if people have tasted blue cheeses only two or three times, all they can discern in them is their specific taste which they perceive as too strong and unpleasant. But if you manage to find something in it and proceed, a great variety of preferable aspects are revealed to you. At the same time, I would not say that wet storage shengs are a kind of up-market arthouse that you can comprehend only in your declining years at the climax of your tea way, having polished your perception to an incredible degree. 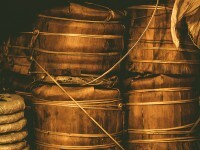 On the contrary, it is not uncommon that a person who does not have a great sheng-related experience, falls for the juicy, rich, exuberant taste of wet shengs immediately, while after long consumption of only dry shengs a taste stereotype may have formed, that can be difficult to shatter. Our taste depends on our previous experience more than on our natural predispositions. When listening to a person describing his or her impressions of a tea I know, the first thing I make a conclusion about is not what the tea or the person is like but what he or she had drunk in large amounts and what had not. If you are familiar with Kunming storage shengs and have tasted them properly while the couple samples of wet storage shengs you have seen were something moldy, it is not surprising that you have formed your particular view. By contrast, I saw a lot of good tea impaired by dry storage; there is lots of that in Moscow, while I have seen little tea damaged by high humidity. But what has had an even greater impact on my attitude is that a fellow tea lover systematically treated me to collection-grade Hong Kong and Taiwan storage shengs for two years. And although ordinary Guangzhou storage shengs are much inferior to them, they are in a way similar, while for Kunming shengs, even rather decent ones, it can often be felt quite clearly what the sheng could have been like if humidity had been at least a little higher. Generally, I recommend you to try various kinds of shengs – those of different factories, different ages, different levels, and different storage – to find your own way. And even if you have formed your preferences, do not restrict yourself to them, continue trying what you do not understand well or dislike to let your preferences change. But there is one thing I would like to accentuate: a sheng with lots of deep camphor notes and something reminding of incenses – not particularly frankincense or sandalwood but something that is not so obvious – something reminding of an old chest, rawhide, mushrooms and wet forest leaf litter, and finally, of a cellar with vegetables, first of all, beetroots and secondly potatoes and carrots, this, dear friends, is not always a wet storage sheng. It is a common development of chén yùn (陈韵), old age melody. I deliberately listed the aspects in the order in which they usually appear with aging but they can be expressed differently, and can neighbor with and overlap one another rather than alternate. Another thing is that under extremely dry conditions the melody may fail to sound. And when there is nothing but bitterish hay or, at the best, dried fruit, there after ten or fifteen years, it is not normal, it is an overdried, spoiled tea. Pu-erh FM Radio. Issue No.124. “Dry and Wet. Shengs of Different Storage”. Old pu-erh tea infusion. 1980 Thai raw pu-erh tea, loose. Wet storage. Fast steepings of 1993 loose raw pu-erh tea. Tropical dry storage. According to some Chinese specialists’ opinions, one has to consider the following 6 properties of t..
“Hong Tai Chang” cakes are ones of the exclusive representatives of the pu-erh tradition - a bright ..
Сaffeine in tea. 8 signs and ways to identify it. Well, what does the content of caffeine found in tea depend on? Is there caffeine in green tea?.. Craft ripe pu-erh. Interview with Tea Mail.